The University of Southampton is subscribed to the TurnitinUK service rather than the US based Turnitin service. This guide explains how to configure the Turnitin iPad app for first time use with the TurnitinUK service. 1. Locate and tap the settings icon on your iPad home screen. 2. Within the settings page, swipe down the left hand menu until you find Turnitin and then select it. On the right hand side of the screen, tap Feedback Studio. 3. 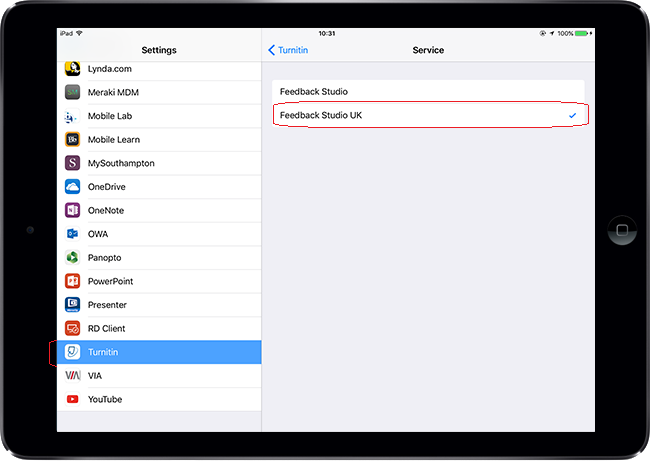 Make sure you have selected Feedback Studio UK. You will know this is selected when there is a tick next to it. Once this has been selected, you can complete the configuration by tapping the home button.